SMSGlobal is proud to support our Australian charity partner, Share the Dignity. Share the Dignity aim to alleviate the financial burden and bring dignity to all by providing sanitary products to women living in poverty around Australia. Today, on the 8th of March, International Women’s Day is celebrated across the globe. This years theme, #BalanceforBetter, is a call to action to drive gender balance and equality worldwide. Share the Dignity have just celebrated the fourth anniversary of their inception, and since 2018, have partnered with SMSGlobal. We’re pleased to donate our messaging services to this outstanding charity, as they strive to provide help to women and girls experiencing poverty and hardship Australia-wide. This year, Share the Dignity are using International Women’s Day to raise money to install ‘Pink Box’ Dignity Vending Machines into disadvantaged schools across the country. 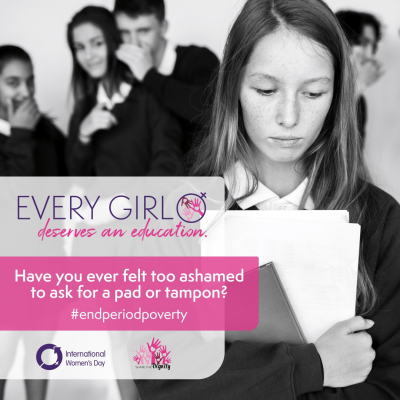 A staggering 27% of girls are missing school due to a lack of sanitary products. 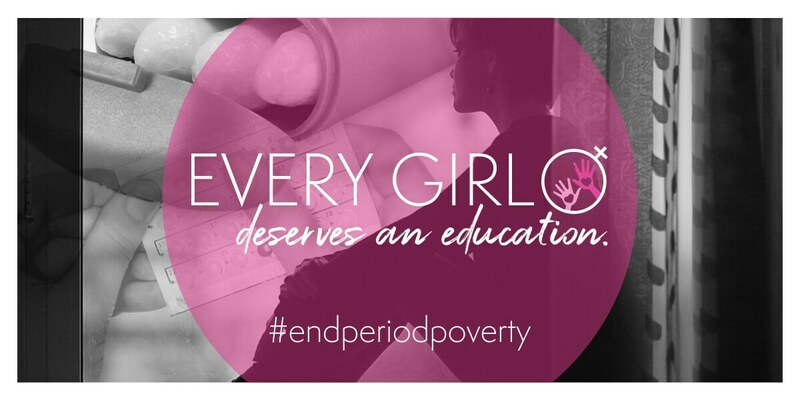 By installing their Pink Box Dignity Vending Machines, Share the Dignity are providing access to sanitary products to vulnerable and poverty-stricken girls who are missing days and days of schooling when they experience their period each month. A fantastic initiative sparked by charity founder Rochelle Courtenay herself, each machine costs around $10,000 to install and fill, so there’s a constant need for donations from their supporters. 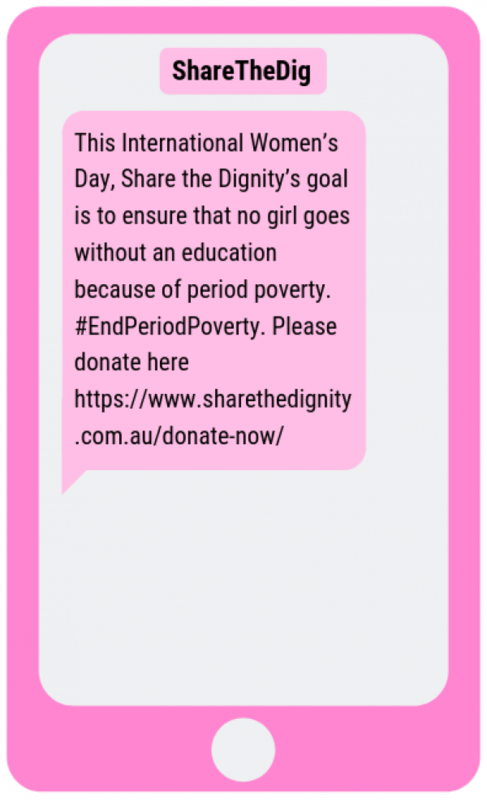 In the lead up to International Women’s Day, Share the Dignity have used bulk SMS through our MXT platform to drive donations from their generous followers and #EndPeriodPoverty by sending a link to donate. By communicating via SMS, the charity is able to reach over 3,000 donors simply and effectively, directly on their mobile phones. This year’s goal is to raise $20,000 - enough to provide two schools, and around 1000 girls, in disadvantaged areas the access to sanitary products. In the past year, SMSGlobal have helped Share the Dignity achieve other important goals. 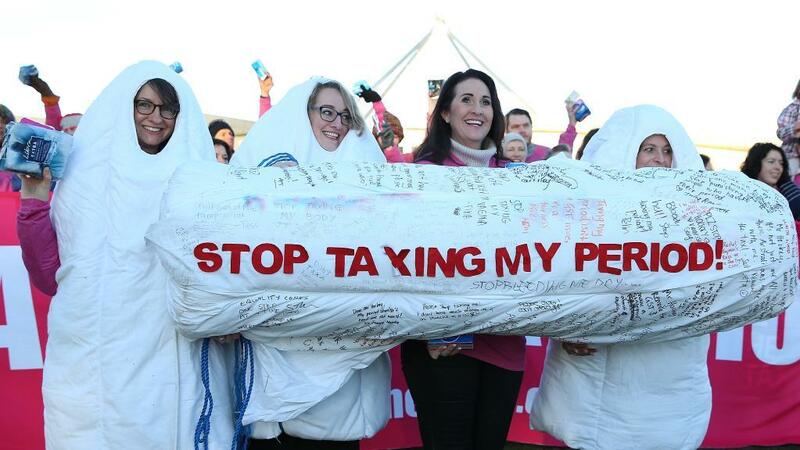 In June 2018, the charity used the messaging platform to mobilise members to meet at Parliament House in protest of the goods and services tax on sanitary products, resulting in a monumental win when it was announced later in the year that the tax would be removed. It has also been used to streamline communications when running nation-wide fundraising events such as Yoga4Dignity and Run4Dignity, providing SMS reminders and notifications, as well as crucial event information in a simple and accessible fashion. The biggest campaign each year is their Christmas “It’s In The Bag” Drive, where supporters are asked to fill a handbag with essentials and ‘little luxuries’ to be given to a woman experiencing poverty over the Christmas period. An enormous logistical project, Share the Dignity is fortunate to have over 4,000 volunteers, or “Sheros” to manage the three-week long drive, and thousands more donors. Using SMS, Share the Dignity were able to easily communicate with their volunteers and supporters, sending bulk messages throughout the drive to increase donations and manage the large number of bags being dropped off. SMS messages to supporters included a helpful link to find their closest collection point to drop off their donations, as well as weekly reminders to ensure every bag was delivered on time. 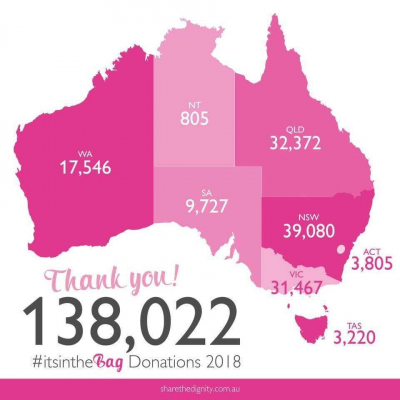 The charity enjoyed their highest number of donations to date, with over 130,000 bags being lovingly filled and dropped off to collection points around Australia, and SMSGlobal were glad to have played a part. These bags were then delivered to women's shelters and domestic violence shelters, spreading joy to those most vulnerable at Christmas time. Their bi-annual Dignity Drives are another massive effort that are streamlined with SMS. In April and August of each year, Share the Dignity gather thousands of packets of pads and tampons donated by their supporters across hundreds of collection points. Utilising our MXT platform, they can efficiently communicate with their volunteers to coordinate the distribution of these donated packets to other charities and crisis-housing centres, ensuring help is delivered where it’s needed most. SMSGlobal are extremely proud to support this remarkable charity, and look forward to assisting Share the Dignity through our messaging services in the future. To donate to Share the Dignity, head to https://www.sharethedignity.com.au/donate-now/. 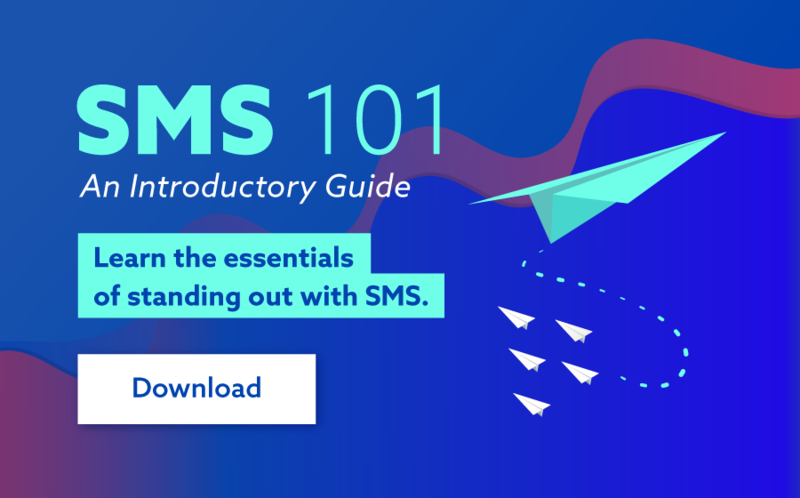 To find out more about how SMS can assist your business or charity, head to https://www.smsglobal.com/ or talk to one of our friendly SMS specialists on 1300 883 400.